Oakfield B&B, situated in the heart of the Blaenavon World Heritage Site, provides ideal accommodation for those looking to explore South Wales or as a stop over enroute to West Wales, North Wales, England or Ireland. 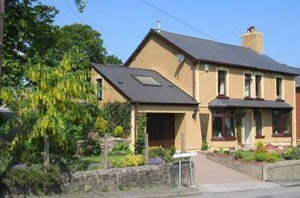 This 4 star rated Visit Wales bed and breakfast can accommodate families with young children, walkers, cyclists, motorcyclists, tourists and business people alike. The bed and breakfast offers a twin en suite, a double en suite and a large family room consisting of two twin bedded rooms with the benefit of a large private bathroom. Breakfast is served in the guests’ own dining room and for relaxing there is a separate lounge for the sole use of guests. As well as a TV, the lounge has a selection of books and board games for use during your stay. For the comfort of all our guests Oakfield B&B is totally non-smoking. There is off road private parking for up to three cars and also a lockable garage for those looking for more secure parking for bicycles, motor bikes, canoes, paragliders, etc. This bed and breakfast is conveniently located with easy access to the M4 (approx 15 miles) and the A465 Heads of the Valley road (approx 5 miles). It is close to many attractions – Big Pit National Mining Museum (1 mile), Blaenavon Ironworks (1 mile), World Heritage Centre (0.5 miles), Brecon Beacons National Park, Brecon & Monmouthshire Canal, Caerleon Roman remains and ampitheatre and many castles including Abergavenny, Raglan, Chepstow, Caerphilly and Cardiff. For those with a more energetic outlook there are many outdoor pursuits in the area such as cycling (NCN route 492 100yds from Oakfield B&B), walking, bird watching, paragliding, caving, go-karting, golf, canoeing and angling.